Click here to sign up for your yard sale permit and map placement. 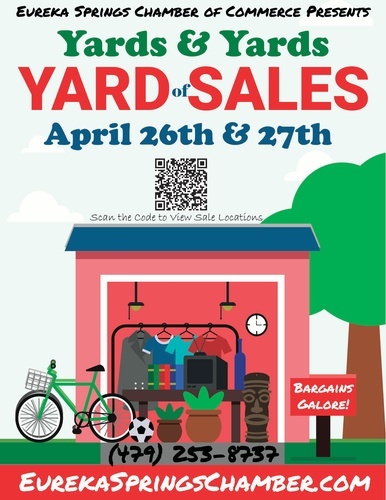 The spring Yards & Yards of Yard Sales event will take place on Friday and Saturday, April 26-27 at locations citywide. Make the most of your efforts by signing up and getting your name on the official YYYS Map. People come from all around to find bargains and treasures in Eureka Springs. Getting your location on the map is easy! Stop by the Eureka Springs Chamber of Commerce at the Eureka Springs Community Center and pay $20, mark your spot on the map, and get your YYYS permit sign. Once the map becomes available it will be online and in local businesses as well as at the Chamber of Commerce. If you are interested in having a yard sale but do not have a yard or live too far out, we have a limited number of spaces available at the Community Center (44 Kingshighway). For more information, email info@eurekaspringschamber.com or call 479-253-8737.